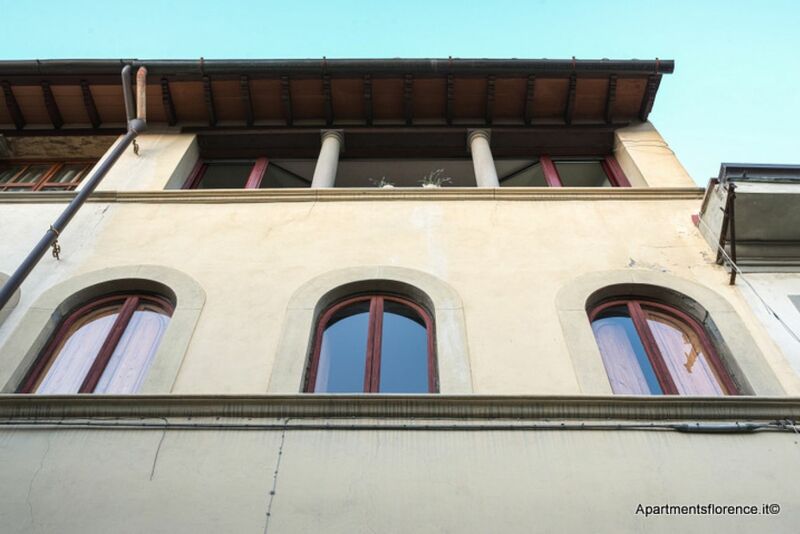 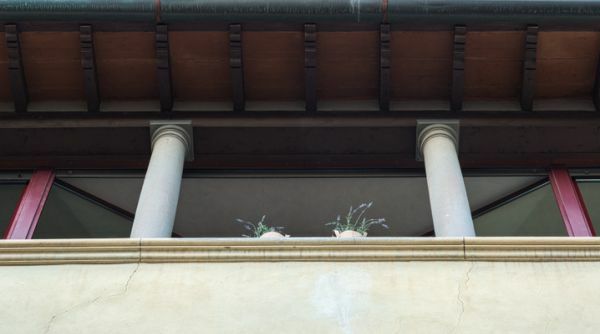 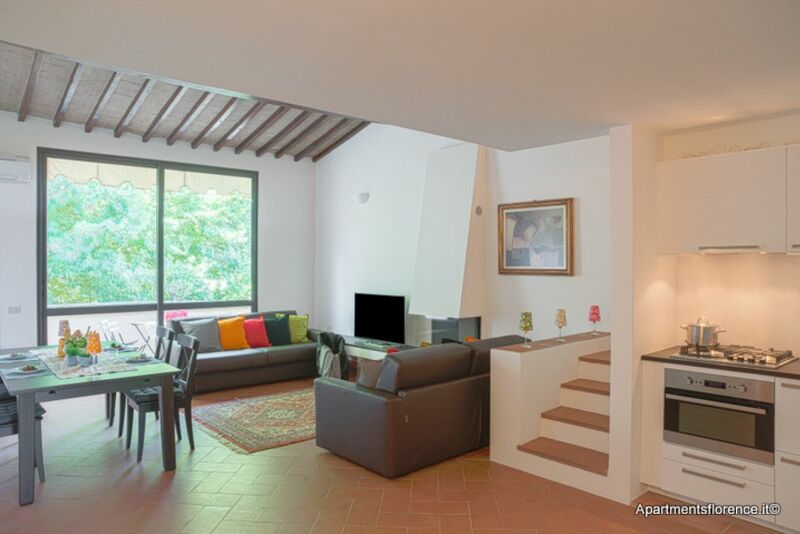 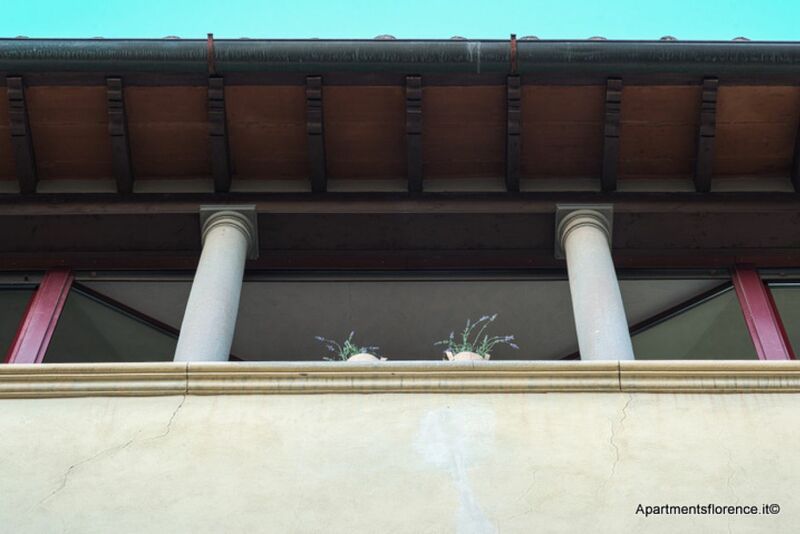 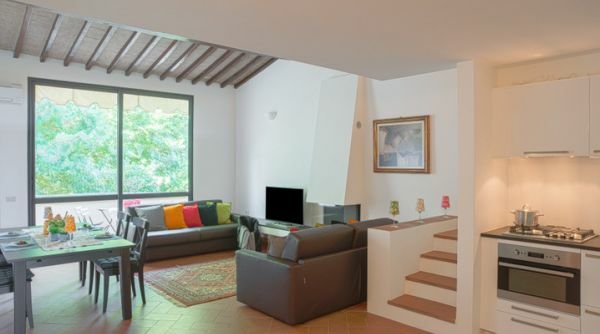 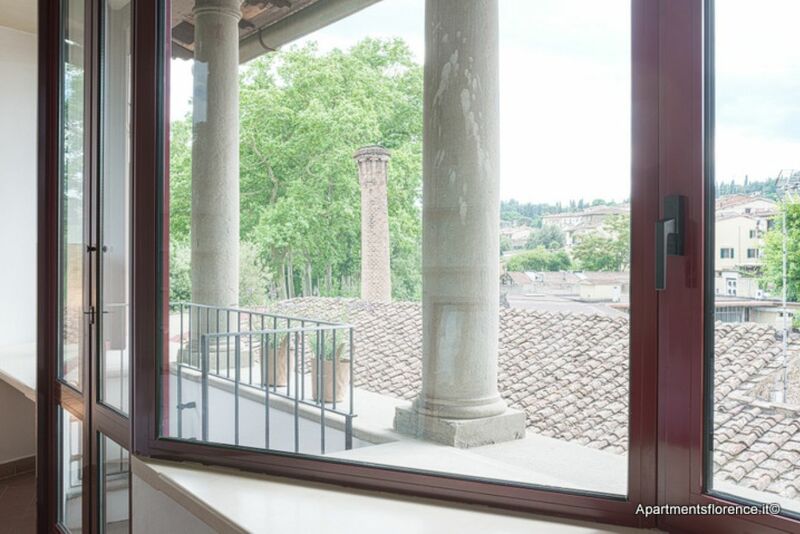 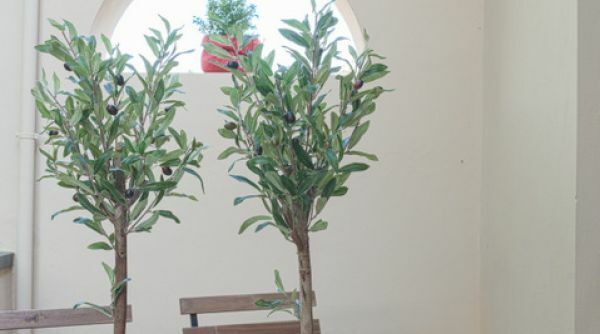 Bright loft for rent in the heart of the Oltrarno in Florence. 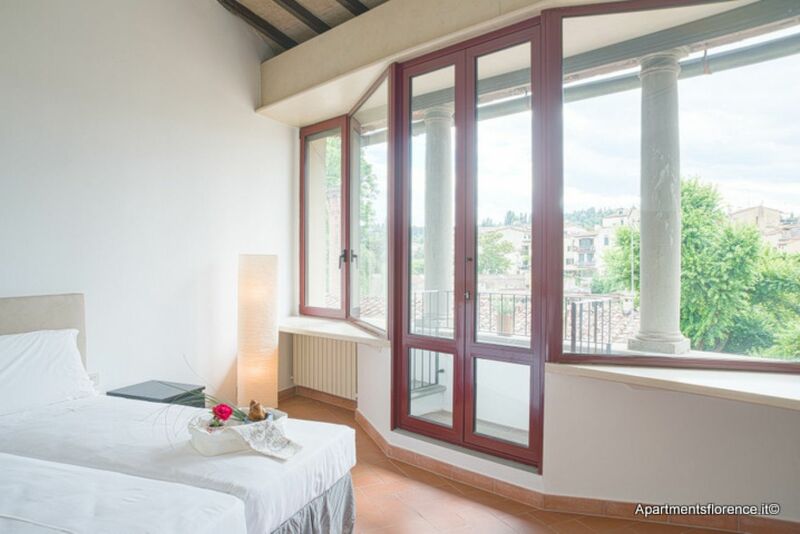 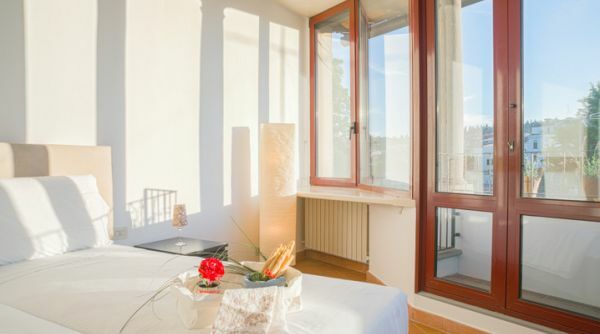 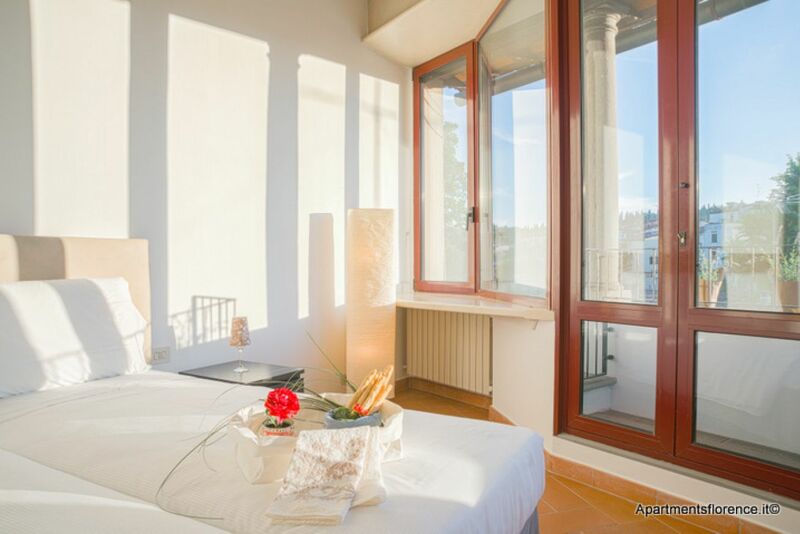 Bright and modern loft apartment nested in the Oltrarno area, just around the corner from Palazzo Pitti, Ponte Vecchio and Boboli Garden: enjoy the beauty of Florence sitting in one of this apartment's lovely terraces! 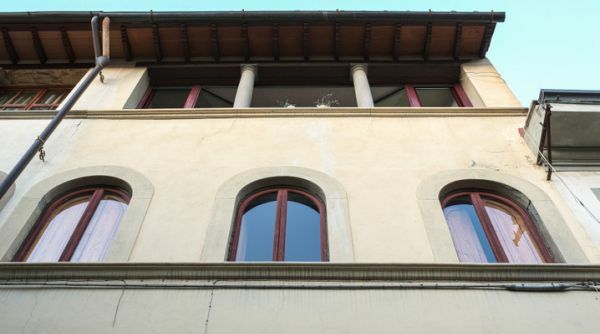 This marvellous apartment is located at the second (and top) floor of an historic elegant building in via del Ronco, a lovely quiet street the Oltrarno area, just beside Boboli Gardens and Piazza Pitti. 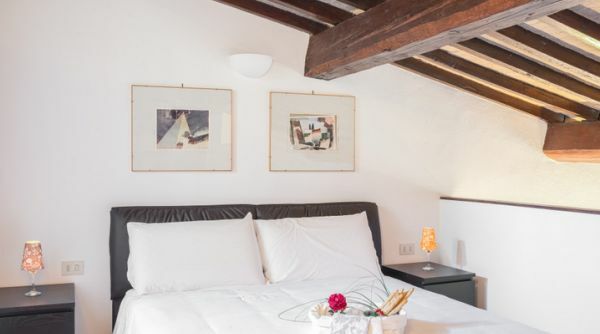 The whole place was recentrly renovated and redecorated with great taste, mixing modern and elegant furniture with a quite rustic feeling given by the wonderful terracotta floors and the exposed beams in the ceilings. 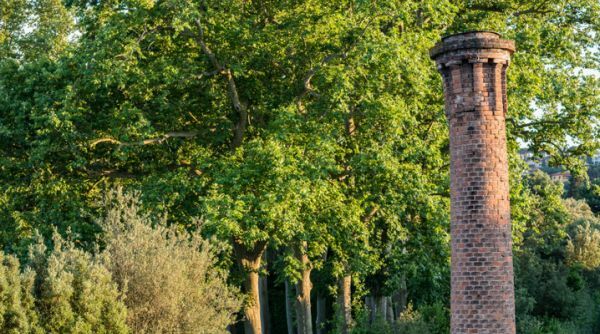 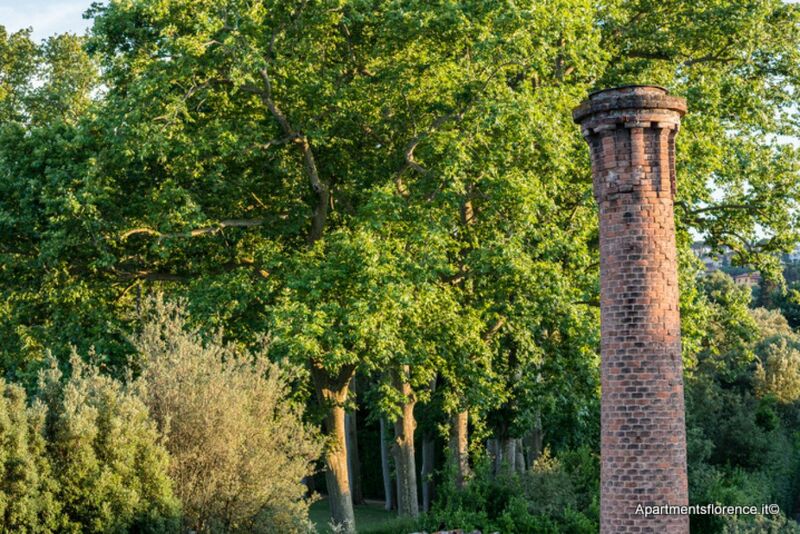 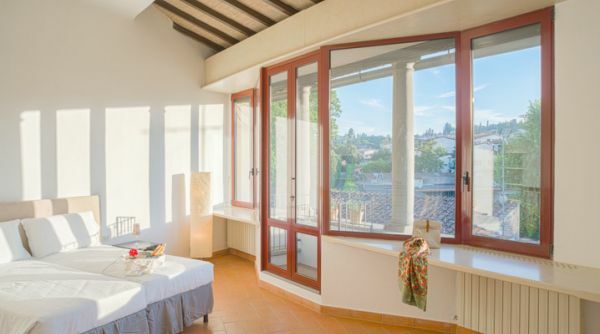 Natural light floods every rooms thanks to the many large vindows facing trees and Boboli Gardens. 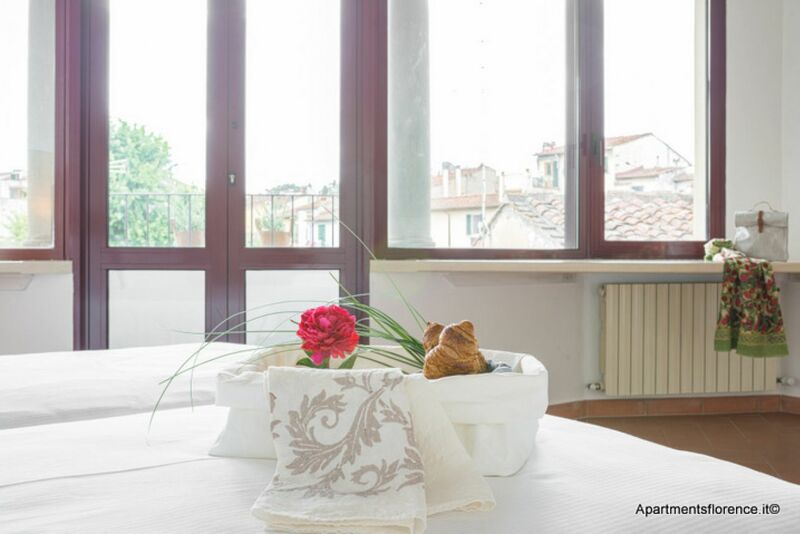 This apartment can accommodate up to 6 people thanks to its two bedrooms, two bathrooms and sofa bed. 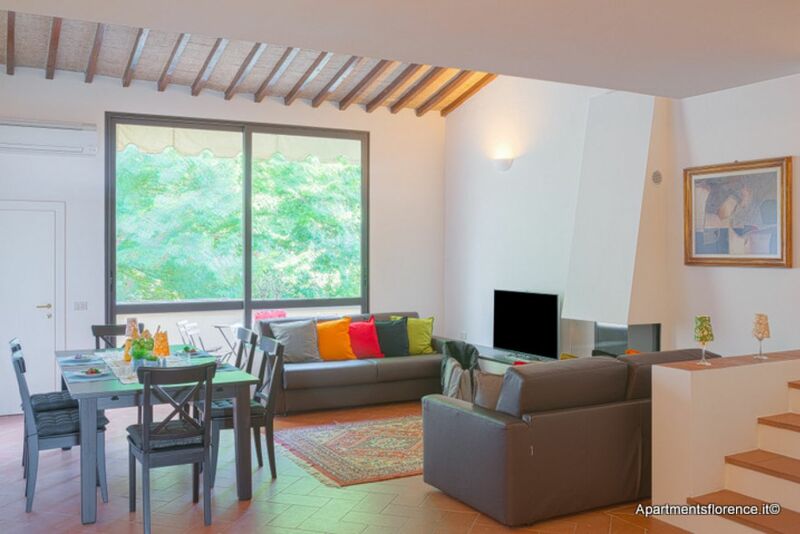 The entrance opens onto the bright and airy living area, a large open space consisting of the fully equipped modern kitchen, a cozy sitting area with couch and sofa bed, and a dining table for six. 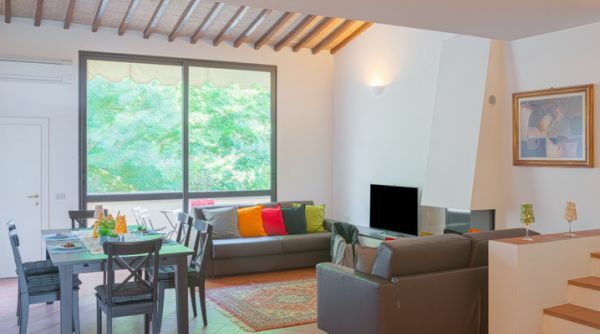 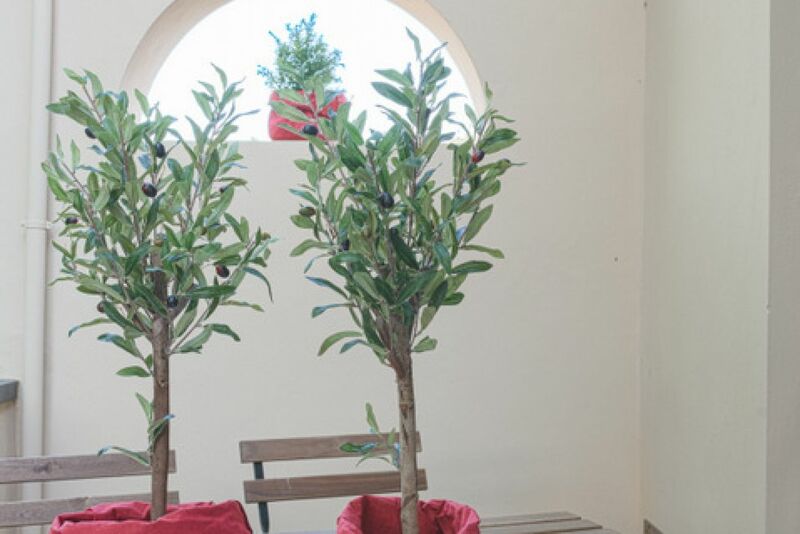 The living area also has access to a lovely balcony facing nothing but trees, featuring table and chairs; an ideal spot for a relaxed breakfast or an aperitivo. 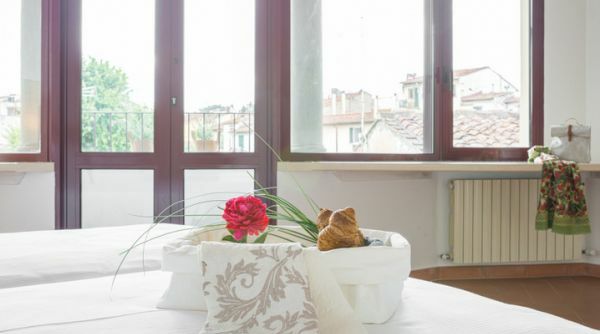 A staircase leads from the living area to an upper level, where you'll find two spacious and bright bedrooms, both decorated with elegance and sobriety. 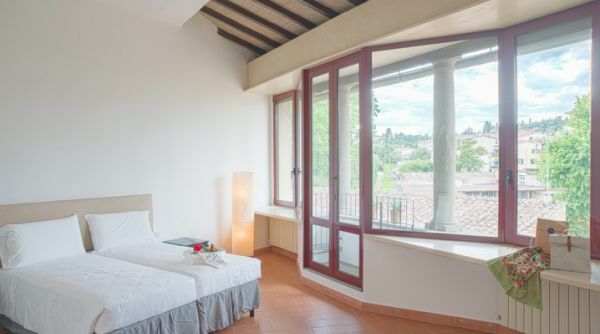 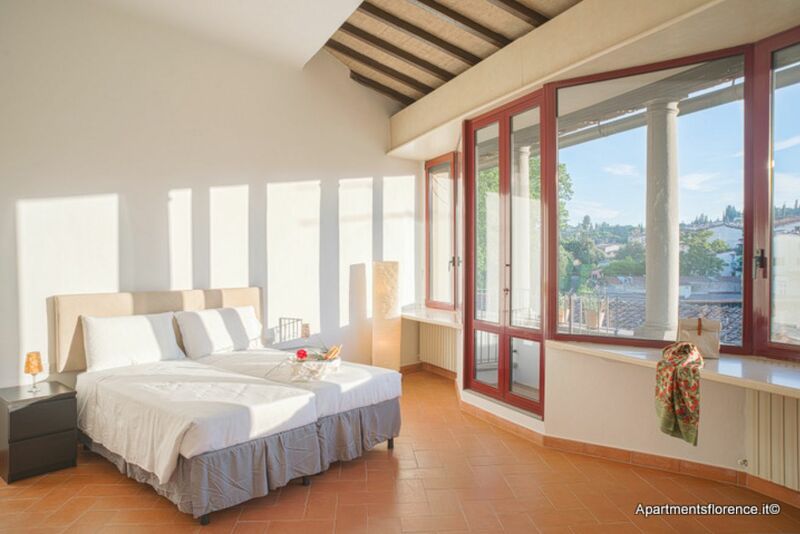 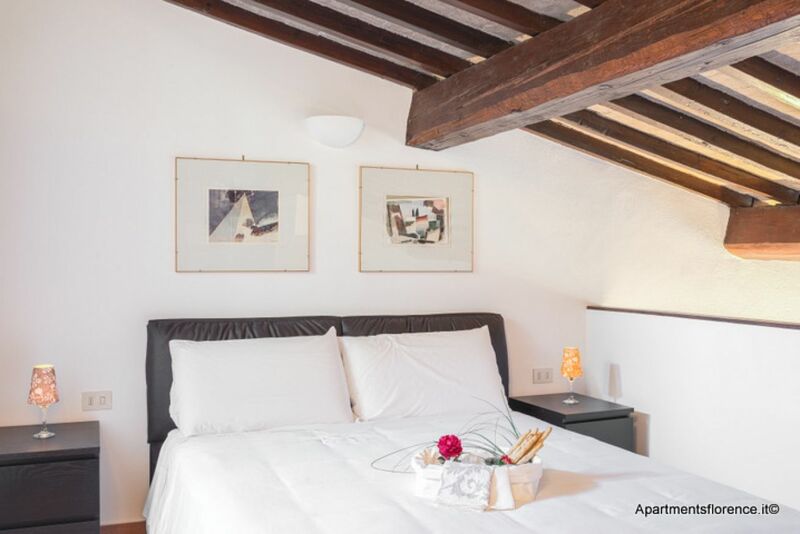 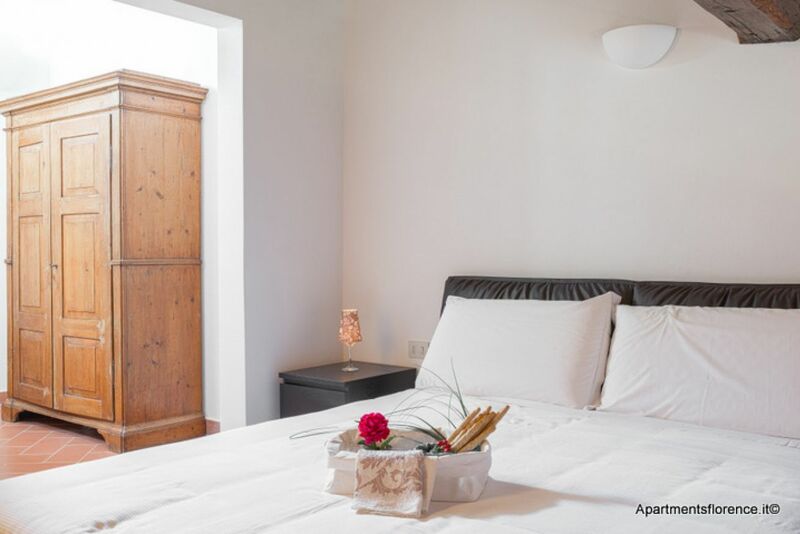 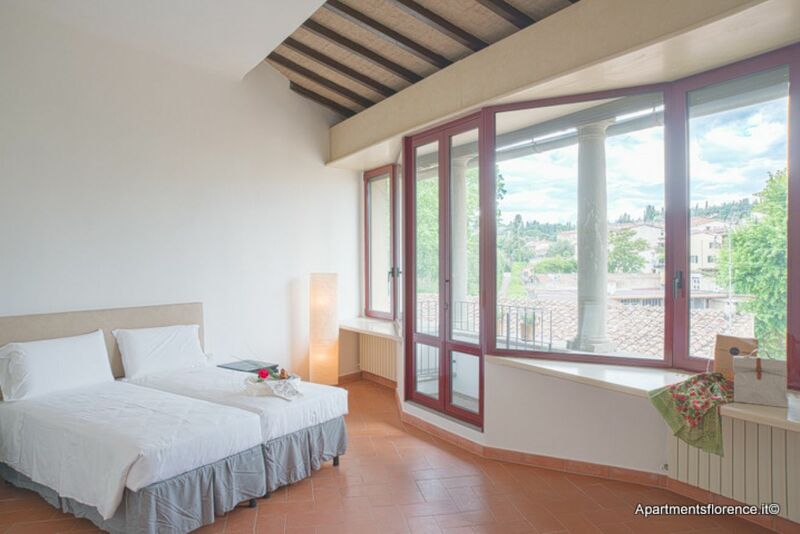 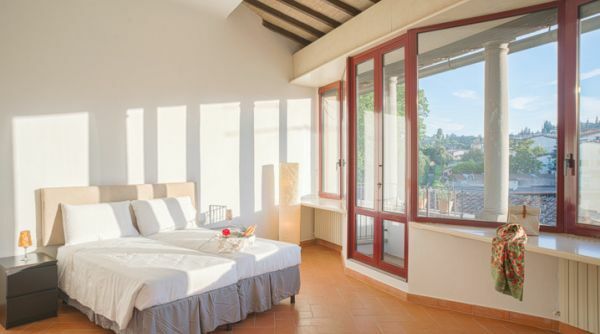 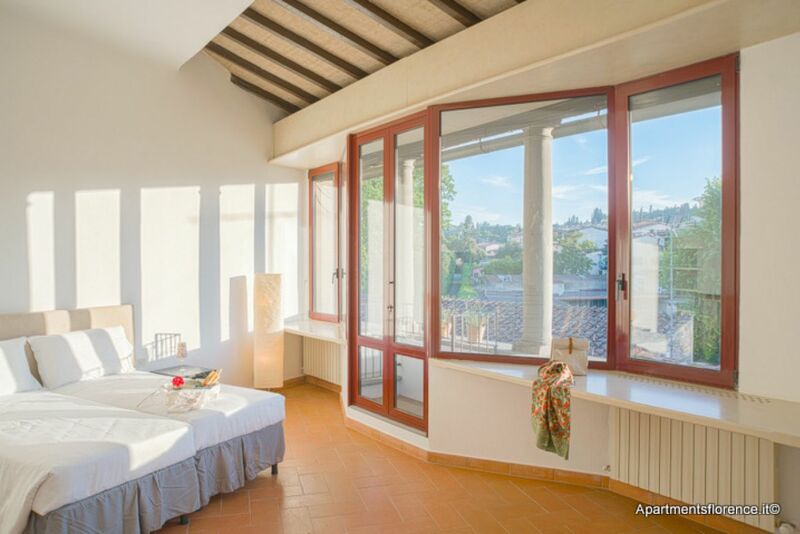 The wonderful exposed wooden beams in the ceilings donate a warm and romantic feel to these two bedrooms, one with queen size bed, closet and private bathroom, and the other with a couple of single beds, desk and access to a lovely porched terrace facing Boboli Garden. 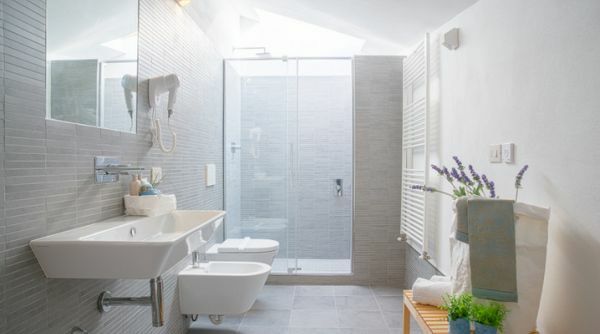 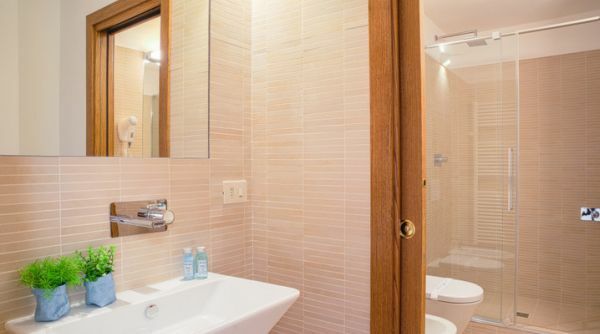 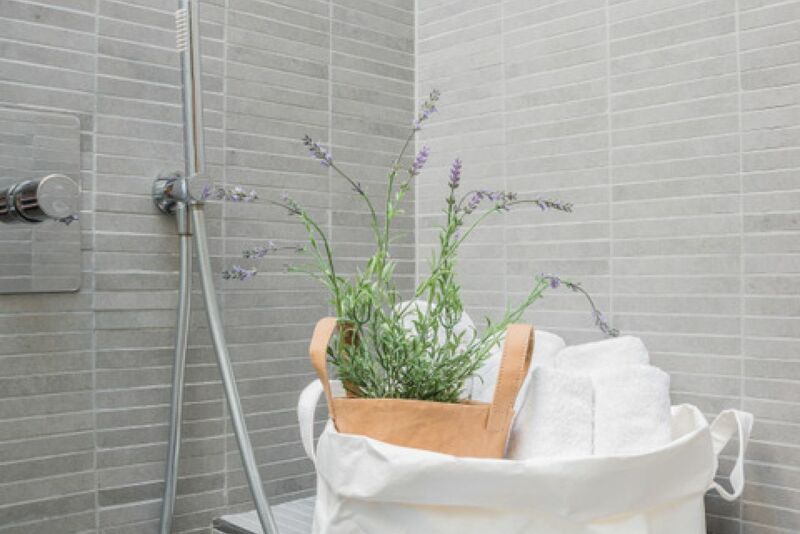 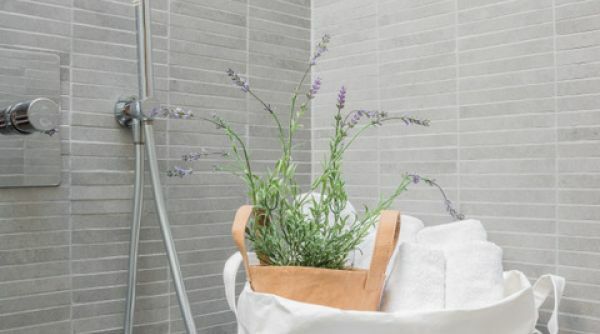 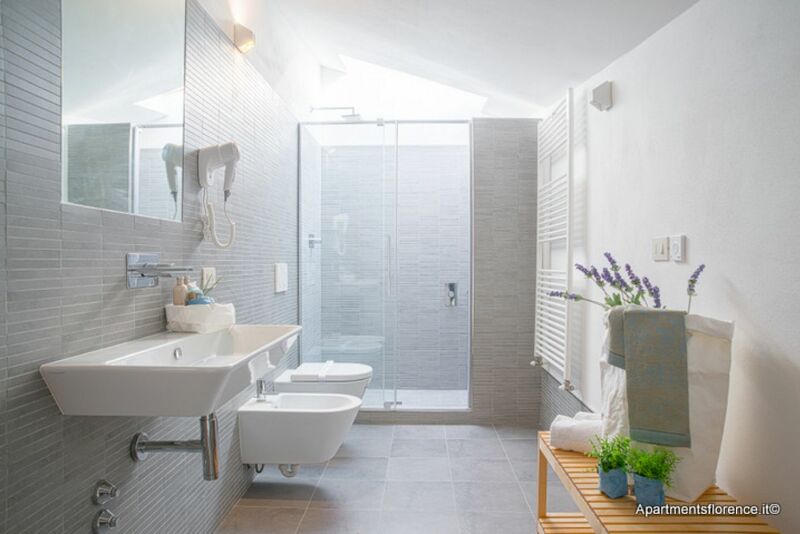 Guests choosing to stay at Ronco Loft will certainly benefit from the presence of two modern and recently renovated bathrooms, both spacious, bright and featuring large walk in showers. 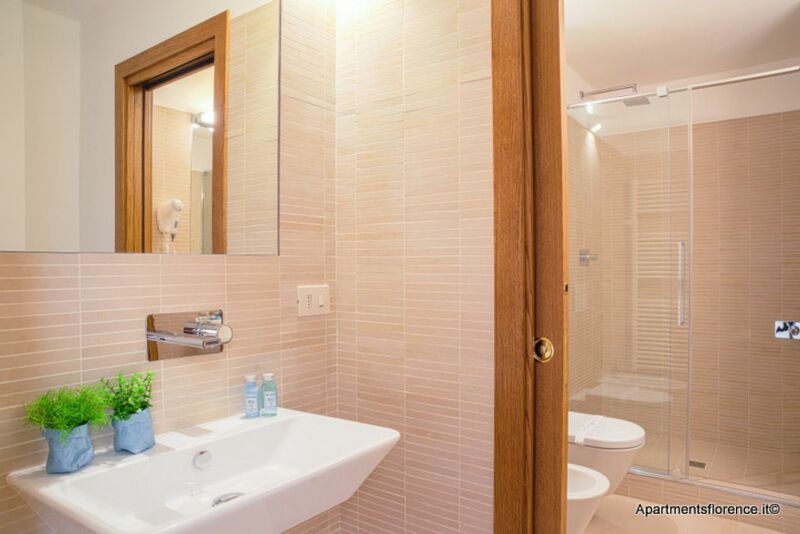 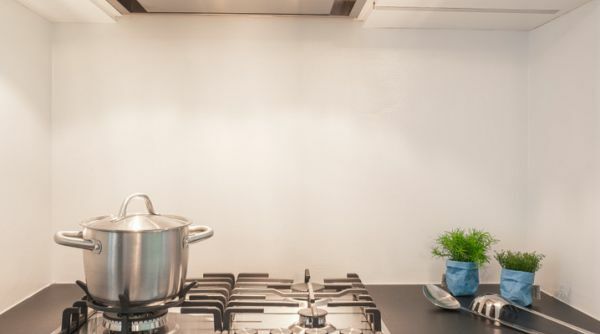 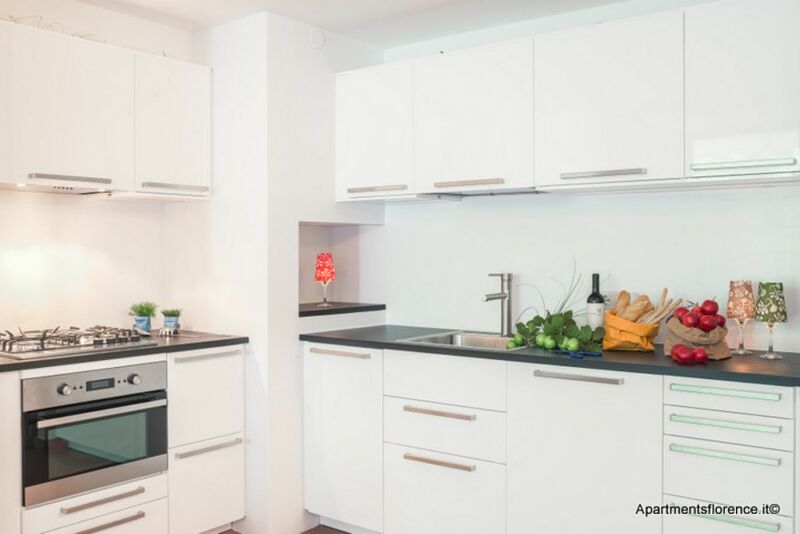 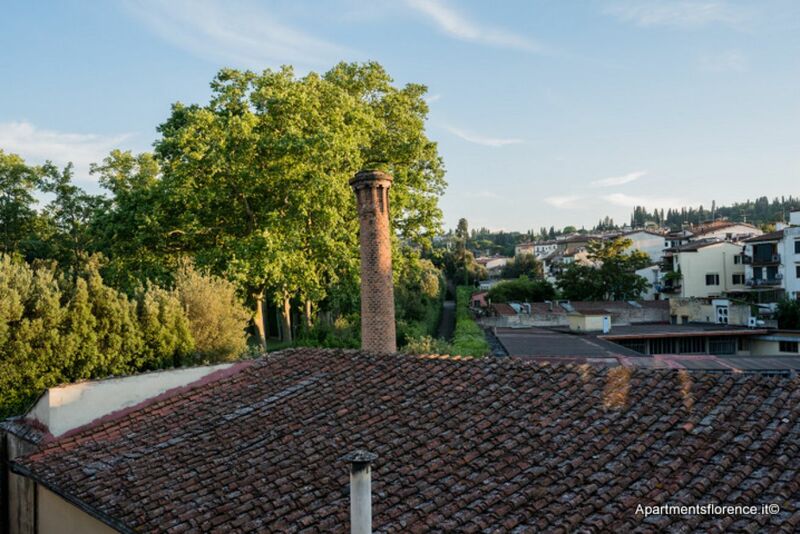 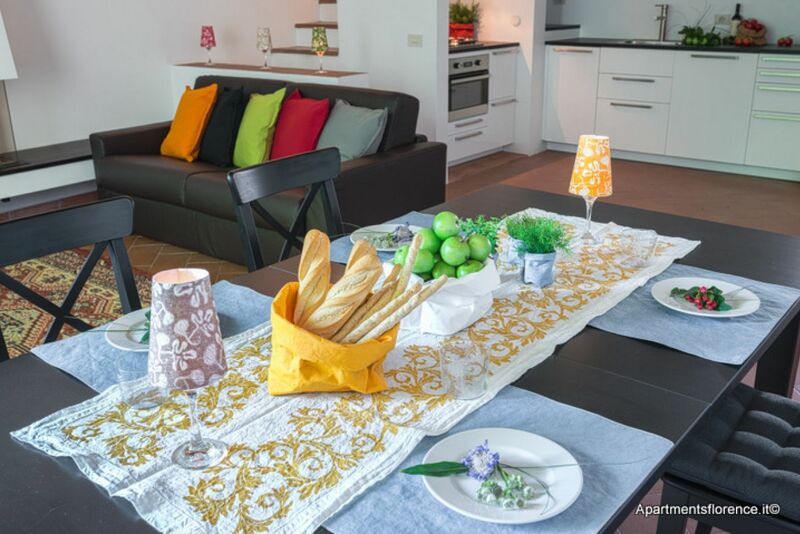 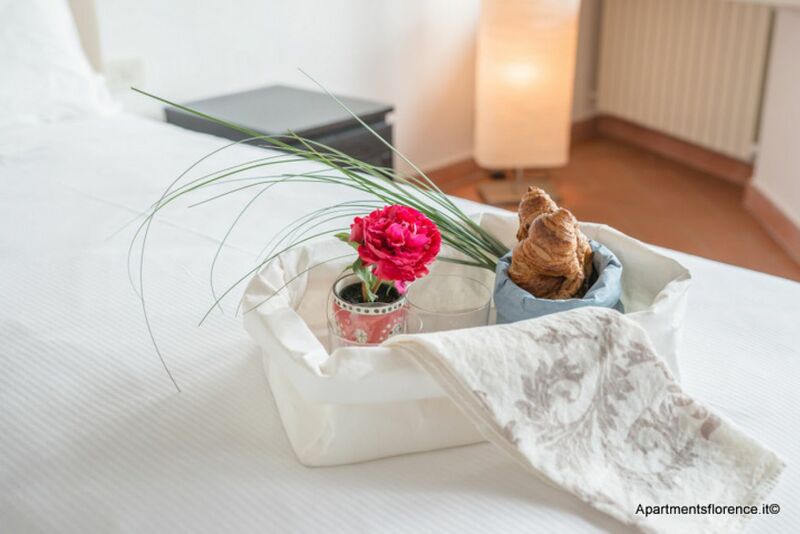 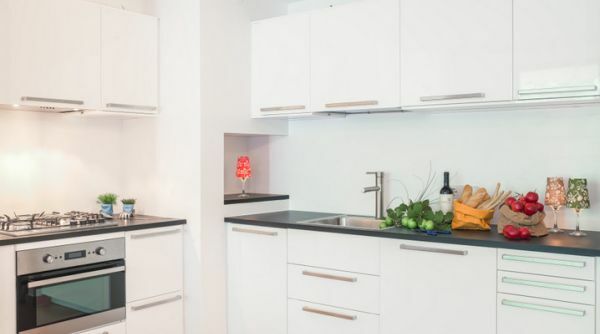 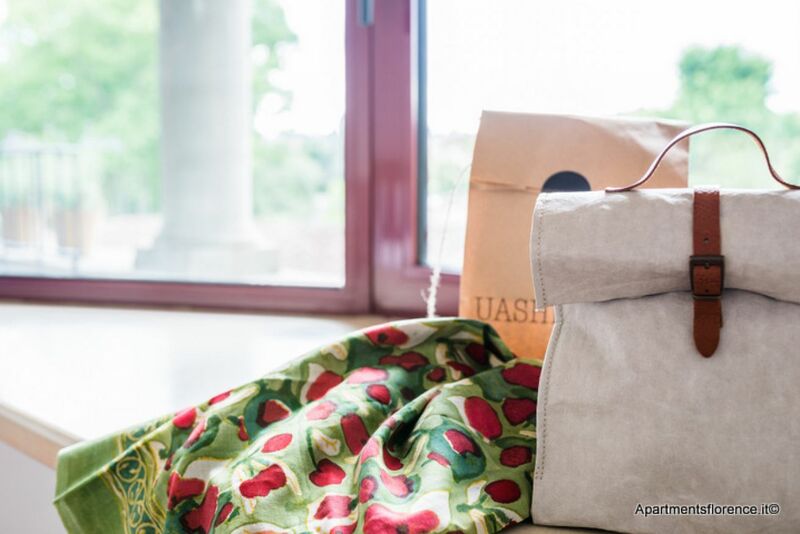 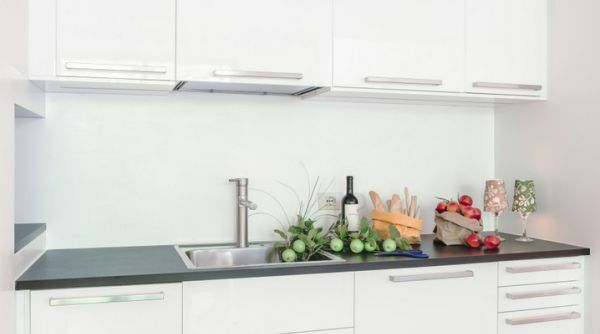 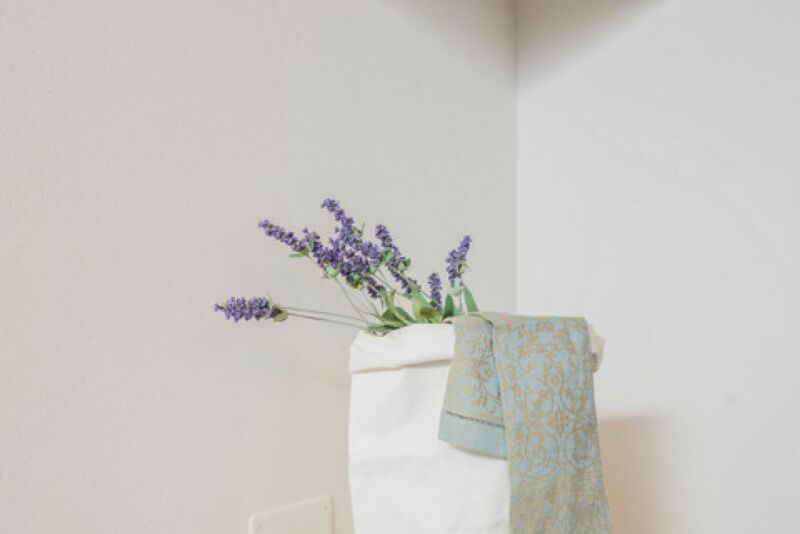 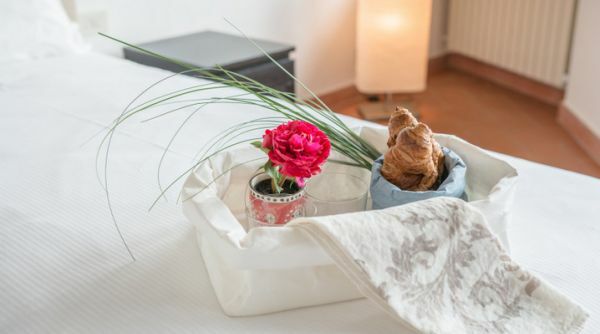 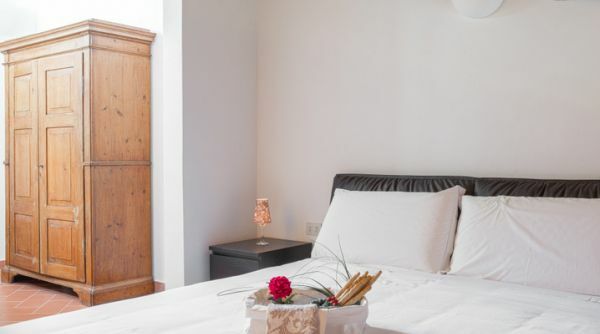 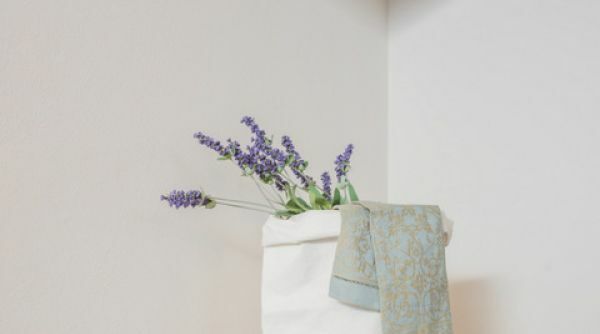 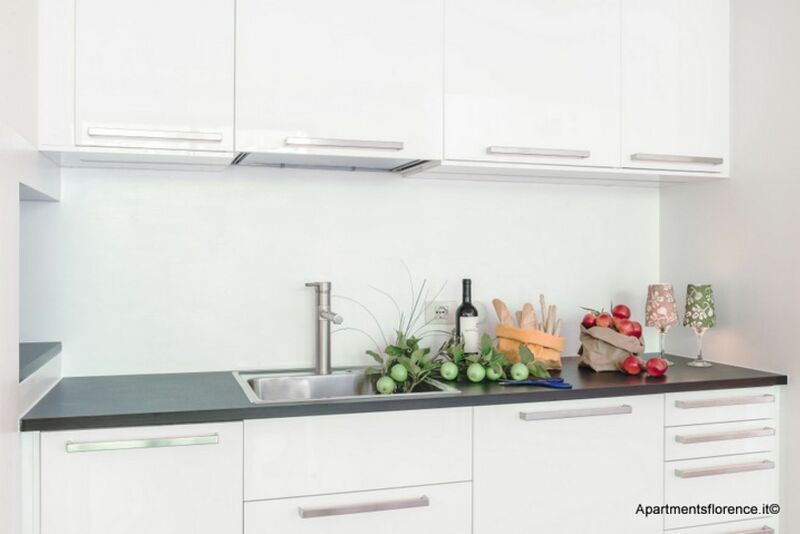 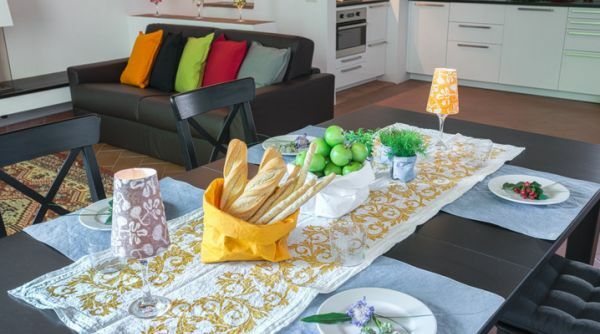 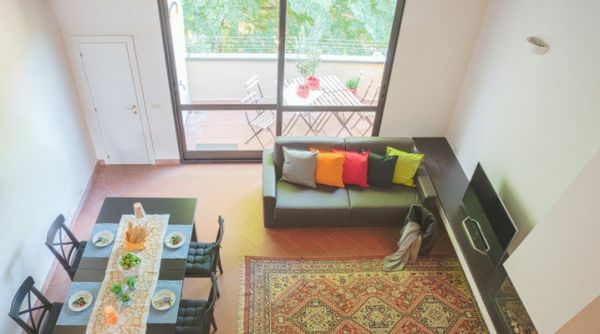 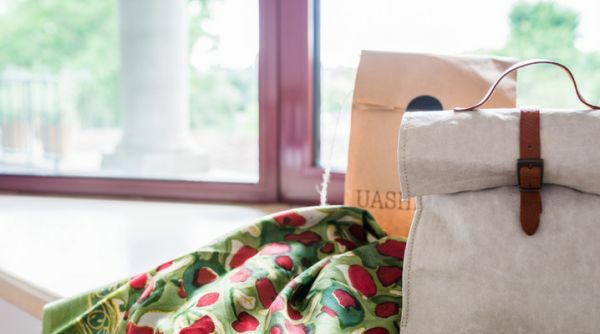 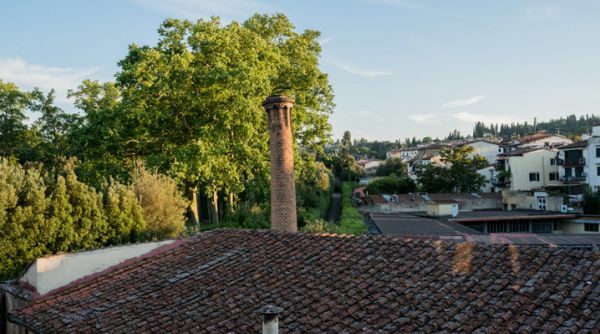 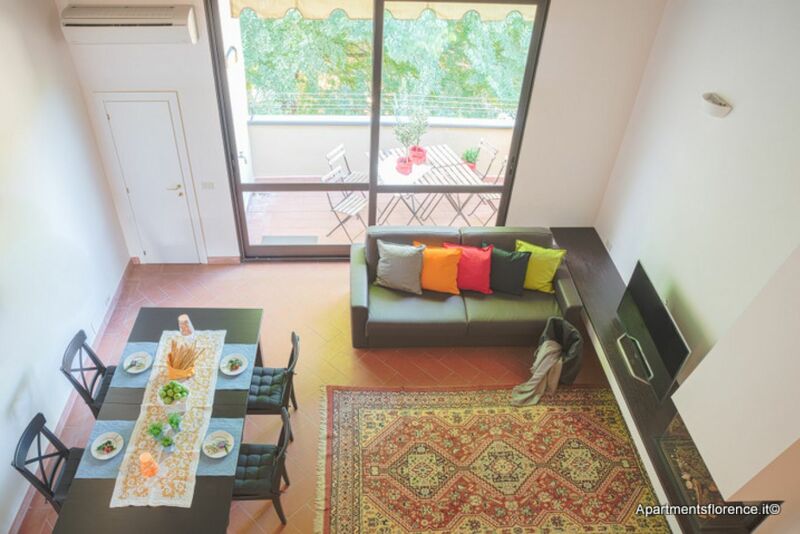 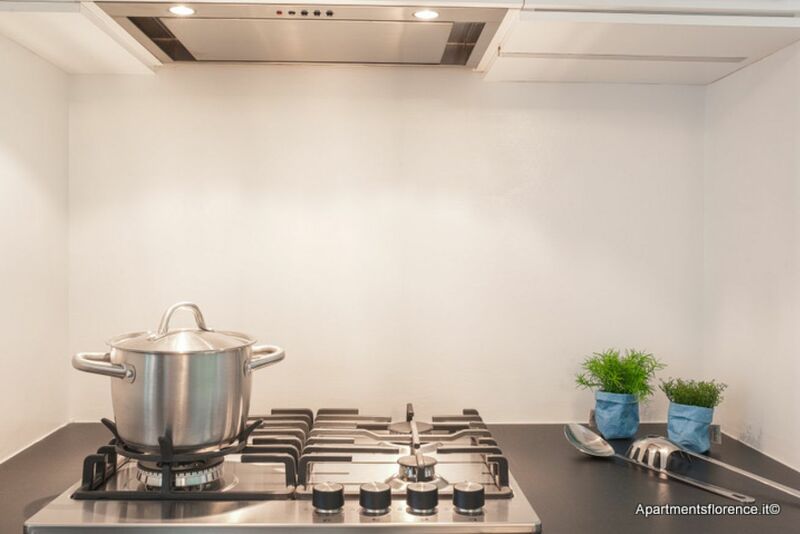 This wonderful apartment is a true jem nested in the Oltrarno area of Florence, a very typical and authentic neighbourhood, filled with local restaurants, workshops, boutiques, trendy cafès and clubs. 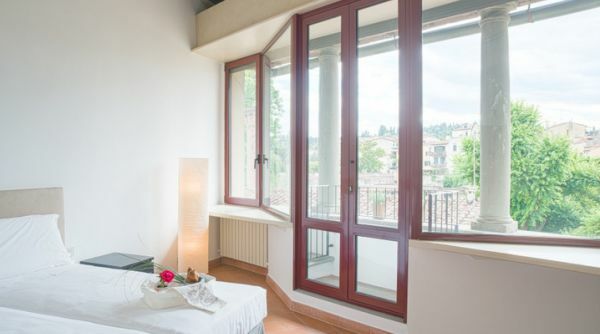 Choosing Ronco Loft you'd have the chance to experience Florence from a Florentine perspective, staying in the heart of a lively and traditional neighbourhood, yet in a very quiet and peaceful street only a few minutes away from Florence's main attractions, such as Palazzo Pitti, Ponte Vecchio and the Duomo.